New York Times bestselling author Sandra Brown is back with a spine-tingling story of murder and betrayal -- and a homicide detective's struggle with his own rules of conduct. When Detective Sergeant Duncan Hatcher is summoned to the home of Judge Cato Laird in the middle of the night to investigate a fatal shooting, he knows that discretion and kid-glove treatment are the key to staying in the judge's good graces and keeping his job. At first glance, the case appears open-and-shut: Elise, the judge's trophy wife, interrupted a burglary in progress and killed the intruder in self-defense. But Duncan is immediately suspicious of Elise's innocent act. And further investigation quickly puts Duncan's career in jeopardy -- because he can't deny his increasing attraction to Elisa Laird, even if she is a married woman, a proven liar, and a murder suspect. 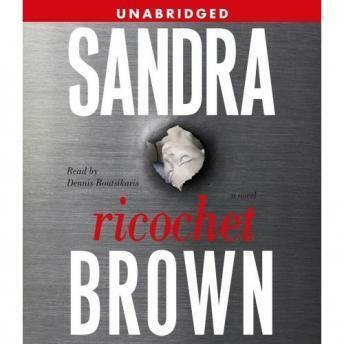 Ricochet's plot twists -- as only Sandra Brown can write them -- make this a gripping thriller, in which a decent cop's worst enemy may be his own conscience...and trusting the wrong person could mean the difference between life and death. Good story - interesting plot with a lot of twists and turns. Will definitely keep you interested to the end. I enjoyed this book. Just when I expected predictable, I got a twist so I really liked keeping on my toes to figure it out. A very good listen. Not bad. I actually had the hard copy, but it took me so long to finish the book, I thought I should just get the audiobook to see how it ends. It was a good way to pass the time. I have this a great listen. Good reader and a story that keeps you guessing till the end. This kept me guessing. I enjoyed most of the characters and the plot twists. I do agree with other readers who said the love scenes were a bit more than necessary. I would recommend it to any fan of mystery. This was an entertaining book but I found it predictable. Though the plot keeps you interested, the romance that develops between the detective and Elise is obvious right from the start. Still, it was easy listening, and I am a fan of Sandra Brown's, so I enjoyed it. I do agree that there was a little too much discriptive romance. Not really necessary for the plot. A little too much romance for me. It reminded me of the detective movies made in the l940's. However, the mystery did keep enough of my interest to finish all 11 cds. Sandra Brown is a good writer, I enjoy her books. She can keep you guessing till the very end of the book. The story was decent but the reader was boring. His voice was very affected & overdone. I found him hard to listen to. It was okay, but not anything that kept me riveted.